The Bullitt cargobike looks like loads of fun.1 It has enough cargo space for a typical grocery run, even for a family of six. Need lockable (or rainproof) storage? Larry vs Harry has that covered, too. 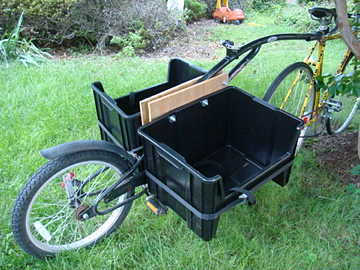 The cargobike would be great for family bike rides. They could become picnic runs, complete with icebox(es), picnic baskets, and folding chairs. And just try to keep the kids from riding in the front. Cargobikes aren’t intended to be put on a bike rack. That would defeat their purpose of eliminating car trips. If you absolutely had to transport them by car, I suppose you could use a rooftop bike rack designed for tandem bicycles. ‘Course, the cargobike weighs 53 pounds, so watch your back. Using a trailer or a ramp to put it in a pickup bed would be better. Looks like I need to investigate Eric Goodman’s grocery-getter. It’s cheap (watch Craigslist for a used frame), works with my existing bike, and is removable for when I need to transport my bike. Still … the Bullitt looks awesome! How do you transport cargo with your bike? Update: Turns out there are local options for cargo bikes — Tom LaBonty and Metrofiets build cargo bikes right here in Portland. Read more about cargo bikes (is it Freudian that I keep typing that as “carbo bikes”?) at BikePortland.org. The steering mechanism is pretty cool. I’ve used my 70 liter backpack to carry loads before. The bullet looks much more comfortable. Yeah, I think it’s supposed to handle 200 pounds or so. Wouldn’t it be great to have a bike with a trunk rather than having to stick your load on your back? I just noticed the name is ‘Bullitt’. Very clever. So, is it named that because of the load it can carry or because of the crafty steering mechanism… So sorry. Oops! Let’s try that in English: “Where other Cargo bikes are often heavy and slow, the BULLITT is only as wide as a normal bicycle and just a few kilos heavier.” I would guess that Larry vs. Harry call it the Bullitt because they’re fast. Maybe… After all, the Dutch word for bullet is kogel.